In this approach to improvisation that we are exploring, the major 25 is the most important thing to learn. You must learn the major 25 voicings thoroughly in all 12 keys as it is the basis of all the latter harmonic concepts. If you skip this step, it will make the contents of this course much harder to understand, practice, and internalise. Before we start to use the chosen melody as a tool for improvising, you must play through all 12 keys with simple voicings. 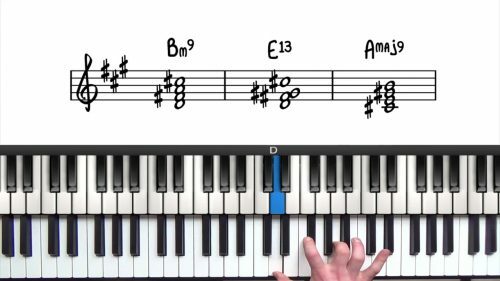 It might take a moment to get through the keys, but it is essential at this point that you learn the melody well and get fast at playing it in any key called. 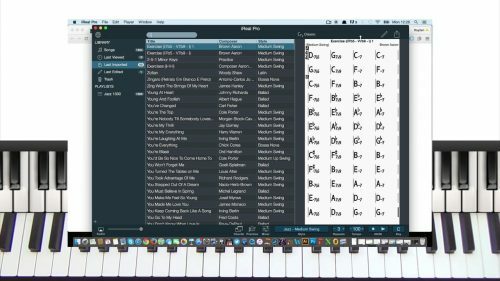 Completing the above steps will help you visualise the melody in every key, and it will help you to play the melody quickly and effortlessly as we explore more advanced applications. Apply The Melody To "There Will Never Be Another You"
Once we have learned the melody well over the 25s in all 12 major keys, it is now time to apply the melody to the chord progression of the tune "There Will Never Be Another You". 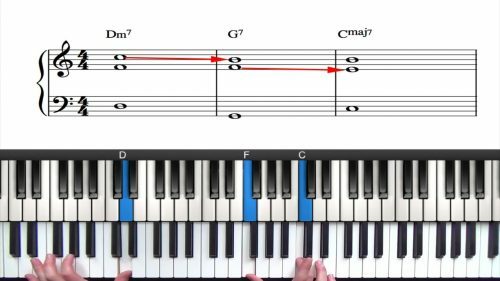 If you have completed the last step as directed, you should be familiar with the melody in all 12 keys, making it easy to apply this knowledge to the chords in the form of the tune. As mentioned in the earlier lesson, you should strive to be able to play the song in every key. This will deepen your understanding of harmony and take you forward as a jazz musician. We will now go through the tune in another key, which of course would be preferable to do in all 12 keys! As an example, we will transpose the tune and the melody into the key of Db. Spend some time to thoroughly learn the melody in all 12 major keys. This forms the foundation on which we are going to build. Once this has been internalised, we are ready to move onto the next part of this course which will bring you more options while improvising and deepen your understanding of harmony. Most jazz standards that you come across will contain a 251 progression in some form so it is essential that you know how to construct the 251. If you are unable to play the major 251 progression in all 12 keys, you must learn it thoroughly before continuing. Check out the related lesson section above for major 251-focused tutorials. The next step is to play the melody over all 12 major 251s. This task is easier if you have memorised the melody in terms of scale degrees of the underlying harmony. As an exercise, find different ways to resolve the melody, see the examples in this video for inspiration. Finally we demonstrate how to play the given melody over every 251 in the tune. Repeat this exercise yourself.